Our continuous, insulated steel and fiberglass-reinforced plastic (sFRP) GREENGirt, custom-profiled, foil-faced polyisocyanurate (ISO) insulation panels, FRP splines that connect the insulation panels, and GREENGirt acts as sub-furring to house the CI which provides cladding attachment support. The application of required accessories (termination angles, tape, caulk/tube sealant and expanding foam sealant) provides an air/vapor/weather-resistive barrier. It is used for open frame installation and provides a simple and easy way to effectively assist in cost reduction, while providing a complete CI solution. NFPA 285 and ASTM compliant. SMARTci 3 in 1 System provides an air/vapor/weather-resistive barrier. The system includes continuous, insulated sFRP GREENGirt, custom-profiled, dual foil-faced polyisocyanurate (ISO) insulation panels, FRP Splines, required accessories (termination metal angles, tape, caulk/tube sealant and expanding foam sealant). GREENGirt: Our award-winning steel and fiberglass-reinforced polymer (sFRP) girt and FRP connector Splines. Pre-cut Rigid Insulation: Class A, foil-faced polyiso insulation panels, custom profiled in factory to connect seamlessly to GREENGirt. Weather Resistive Barrier (WRB): The application of our simple, cost effective and easily installed accessories that, when applied together, provide your building with an air/vapor/weather-resistive barrier. 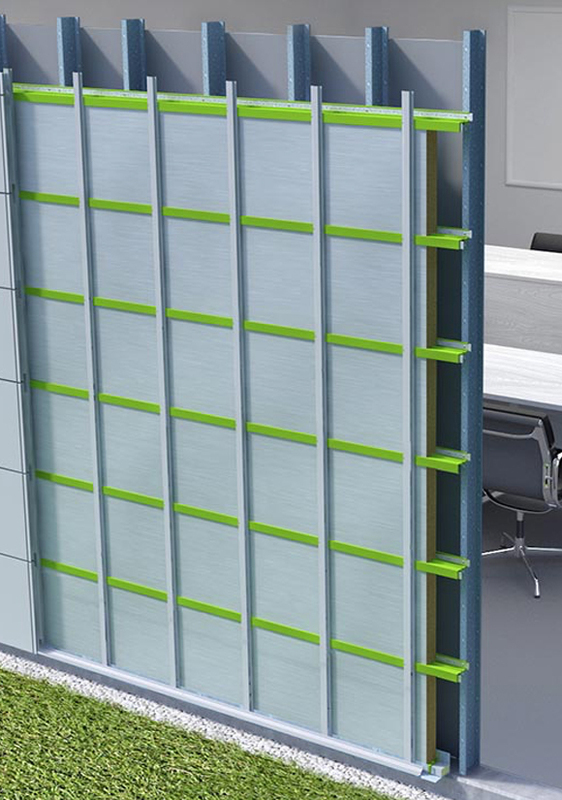 GREENGirt connects to our pre-profiled rigid insulation panels, and acts as sub-furring to house the CI and provide cladding attachment support– ensuring zero thermal bridging. Once installed, it becomes the ideal base for our efficient system of accessories. The finished product is a high-performance CI building envelope with the highest thermal efficiency ratings available.